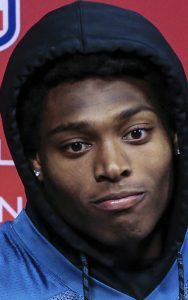 JACKSONVILLE, Fla. — All-Pro cornerback Jalen Ramsey wants to cover the No. 1 receiver each opponent has to offer. He welcomes the challenge. He even requests it. In the AFC championship game at New England on Sunday, it’s a tight end. Rob Gronkowski is considered the NFL’s best at the position, a 6-foot-6, 265-pound behemoth and a daunting matchup for nearly every defender in the league. “He hasn’t played a corner like me before,” Ramsey said Friday. “If I had to bet on a corner to cover (Gronk), I’d put money on Jalen Ramsey for sure,” quarterback Blake Bortles said. “I’ve been impressed with everything I’ve ever seen out of him. His physical tools and obviously his mental toughness and what he’s able to do throughout the game and kind of getting in guys’ heads and doing different things. Jaguars defensive coordinator Todd Wash, as expected, offered few hints about what could be in store for Gronkowski. Is having Ramsey cover Gronk part of the plan? “Jalen is a freak,” Jaguars veteran tight end Marcedes Lewis said. “Tall, rangy, long arms and physical and can run. It’s tough for a tight end because a lot of us are long striders. When you get a guy disrupting stuff and punching you and messing up your stride, it can be tough.